Singer Akothee has been dominating media reports lately as she tries to make a change in the society. 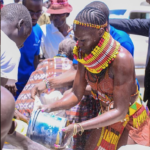 It all started when she traveled to Turkana to help the residents there who were starving. The singer donated food and several tanks of water in an effort to help the community. Akothee was recently forced to deny that she’s doing all these things as a soft campaign since she might be joining politics soon. “I am not joining politics any time soon , but I believe its my Responsibility as a citizen to participate in the wellbeing of my environment, if all of us had the same spirit of checking in our leaders, supporting them as we place our grievances, I believe there will be change, Imagine if we had the whole Nairobi come out today to clean and clear the sewage, ahead of the rains, we won’t have regrets when the heavy rains falls, but because we believe we voted someone in for that matter, that’s where we go wrong ,! Did we follow up ? Have we taken responsibility of our well being or our neighbors? ” Akothee said. Change She added that she’s just using her platform to make a change and believe Kenyans should do the same instead of waiting for things to happen then rush to social media to cry out. “Our environment and economy ? Do we attend the public meetings or we watch TV at Homes and wait to scream on social media ? I think most of our leaders are approachable, and we can use this platform to bring change other than lamenting and cursing I BELIEVE IN CHANGE. It starts with you,” she said. The post Akothee denies she’s helping people because she wants to join politics soon appeared first on Ghafla! Kenya.